We finally made it to Men's Wearhouse to choose tuxedos for Mj and the groomsmen. Mj is pretty quick and easy to please when it comes to making decisions so we had the whole thing booked in about 45 minutes. I already knew going in that the groom would be wearing a silver vest with a silver tie. I have some silver beading in my dress and as much as I would love to see him in my fav color pink I decided to have him match me. We put Mj into a 2 button jacket that looks like the one pictured here. There were really not too many pinks that were the exact shade we wanted so it didn't take too long to narrow that one down for the groomsmen. We went for a 3 button for them so that the pink vest will just barely peak out from the jacket-so it won't be too much. 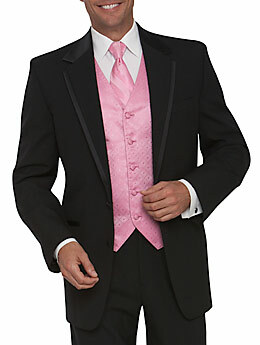 It takes a confident man to wear pink and I think the groomsmen are up to the task. Mj has already broken the news to them that they will be wearing pink and no one seems too bothered by it. Not that it matters right? I'm running the show here! I told Mj if he pays for my dress then I will pay for his tux! Let's just say he didn't agree to that one. Not exactly a fair trade. So much attention is paid to what the bride will wear but if I'm the star he is my co star and he's got to look good too. I've never seen him in a tux and I have a feeling he is going to wear it well. We booked our party choices with a $40 deposit that will go towards Mj's rental which will total $124.00. They gave us an exact order by date and order number to give the groomsmen and the tux will be available for pick up 2 days prior to the event at whatever location they choose. Just one more thing to check off my list. Other then the cake that was the final thing we needed to get done. Speaking of the cake. We picked up our last set of samples yesterday and will definitely taste them and make a final decision tomorrow. We need to book it and put down our deposit, ideally before the utter chaos of packing up all of my worldly possessions into boxes and starting the moving process. After that we went to the movies and watched Iron Man 2 (which was very good) while eating copious amounts of candy from Target which is infinitely cheaper then buying a thing from the Theatre. We hadn't eaten much all day and were hungry starving. We have some food in the house but if we need more ingredients to put a meal together we aren't getting them sine we'll be moving soon. We're not cooking until we get set up in our new digs. We went to a Mexican restaurant on the way home where they have happy hour all day on Sunday. Gotta love it! Hmfff....I really enjoyed my beer but now it's time to get ready for Monday. My man would never wear pink. Gotta love crossing something else off the list. Sounds like you got some good work done! I sneak in candy too!!! it's such a rip off to buy it there! I'll buy the popcorn but that's only because it's irreplaceable!!! Men's Warehouse did great job with our tuxes! It worked perfect too because we had groomsmen coming from all over the country!